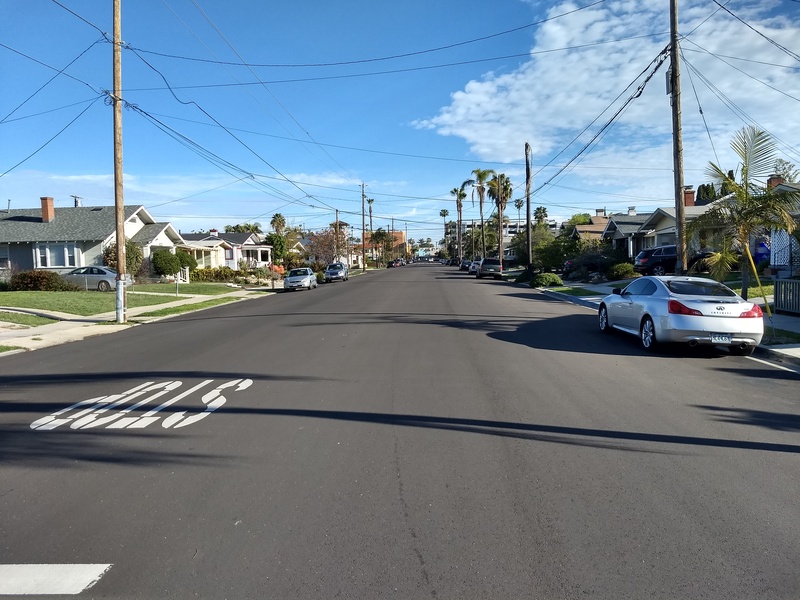 Thanks to a request from the Mid-City Parking District a number of streets in North Park will likely soon be converted from parallel on-street free parking to head-in on-street free parking. The following list of requested changes will result in an increase of 254 parking spaces, using more of our public land to store empty automobiles. The proposed changes were discussed at the March meeting of the North Park Planning Public Facilities and Transportation Subcommittee – minutes including discussion can be found here. The proposed changes are on the agenda for the North Park Planning Committee consent agenda for Tuesday, April 17. The proposed changes are spread across a large section of North Park, but the stretch of 29th Street is particularly interesting to me. 29th Street is the site of the North Park Parking Garage – a 100% taxpayer funded parking garage with low rates that rarely breaks even (and in the most recent year likely lost money due to popularity of biking, walking, and Uber / Lyft – financials aren’t yet out to verify performance). Here’s a map of the blocks of 29th Street and cross streets proposed to be converted to head-in parking (identified in red). Climate change and health – Increasing automobile parking runs counter to the city’s Climate Action Plan goals to move mode share away from automobiles. 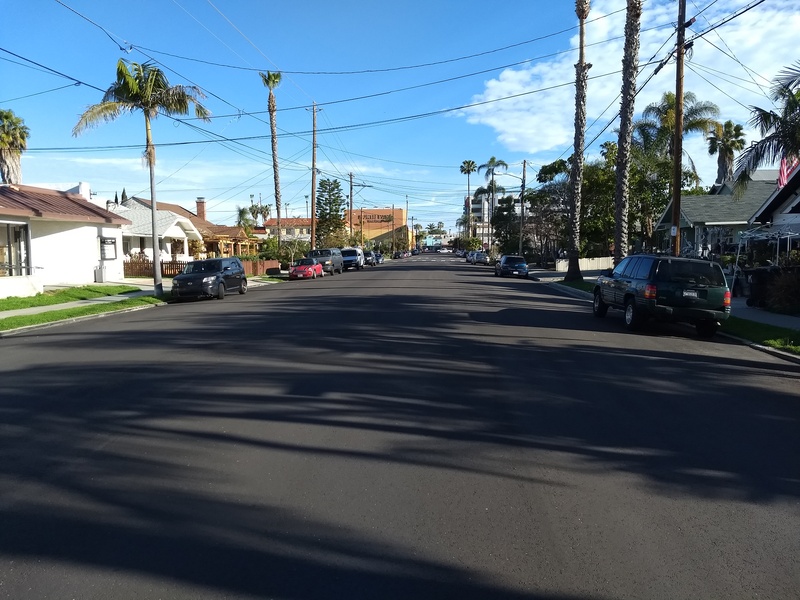 Bringing (and parking) more cars in North Park brings more air and noise pollution to the neighborhood, in addition to the potential fatalities and injuries that are common from automobile use. Giving away even more of our public realm to parking is a bad idea. Increasing and encouraging more automobiles in North Park also runs counter to the promotion of the area as a walkable neighborhood. At a time when bike-share, scooter-share, and ride-share options are plentiful and increasing we shouldn’t be increasing the amount of parking for private vehicles. Aesthetics and safety – This stretch of 29th Street is full of beautiful Craftsman homes. The average age of the homes on the block is around 90 years old. Parallel parking creates a standard car edge so visibility down the street for pedestrians, drivers, and residents is clear. Head-in parking creates large variances (think of an extended cab pick-up, which are for some reason incredibly popular in San Diego despite the urban environment lacking steers and I-beams to carry around, parked next to a small sedan). Pulling in and out becomes more dangerous for those traversing the street. Additionally, the headlights from the vehicles at night are aimed directly into homes which are mostly at street level. I can’t imagine most residents would enjoy the additional lighting from the street. 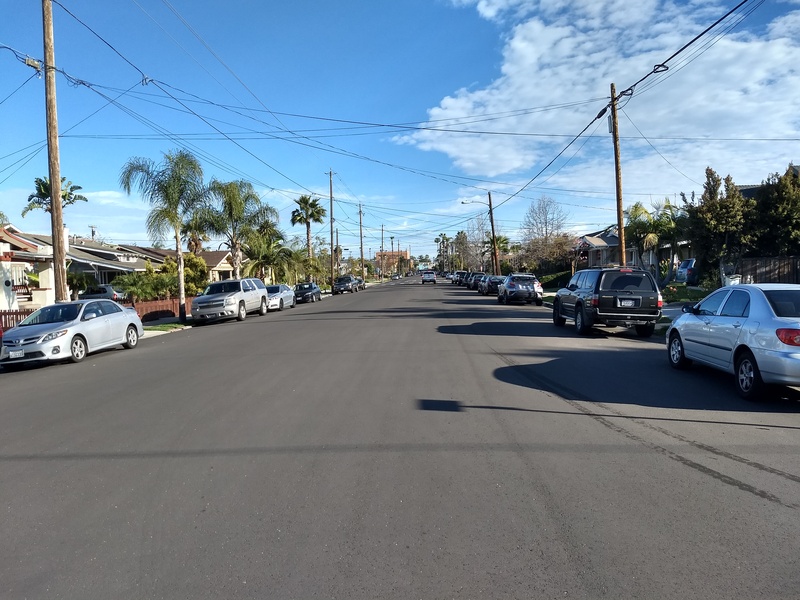 Unneeded and counter-productive – Most of the houses on these streets already have off-street parking, many have full length driveways and garages. The housing density (number of residents per unit) is almost certainly less than it was 50 years ago, as the average American household size has fallen almost by half. If the housing is nearly a century old and the households are smaller than they have been in the past it seems unlikely that residents are clamoring for more parking on the street to bring in more traffic and noise. Here’s a photo gallery of each block of 29th Street to get a sense of the housing and parking. The street is very wide but as you can see, there is hardly a lack of parking although this may vary according to time of day. Perhaps the worst bit of all is residents have basically no say in this process. The parking changes were requested by a parking agency and I don’t believe any residents of any of these streets were part of the application – apparently the mission of parking agencies are to maximize the amount of parking for vehicles. Residents will have a chance to respond negatively to the proposals, a written notice will be sent out. Who does the notice go to – property owners or residents? (Not sure.) Are the mailings certified delivery to ensure receipt by intended recipients? (Guessing no.) Even if the letters are addressed properly, and received what are the odds they are read or understood? (Not likely.) The standard to oppose is that a majority, more than 50%, of the notices sent out must be returned in opposition. If you’ve ever done a survey or mail response campaign you probably understand there is essentially zero chance of ever seeing a 50% response rate to any issue. If there is demand from the residents on the impacted streets then an Opt-In approach would pass with flying colors. I suspect that there is not support from the residents given the above many reasons this is a bad idea. In either case, I believe the North Park Planning Committee has discretion on this matter to evaluate as they deem most appropriate. I hope they’ll opt to consider the impacts of yet more automobile-focused use of our land in this urban environment and reject this proposal to bring yet more traffic and parking and associated ills to the area. For reference, here’s the evaluation policy for this sort of proposal. 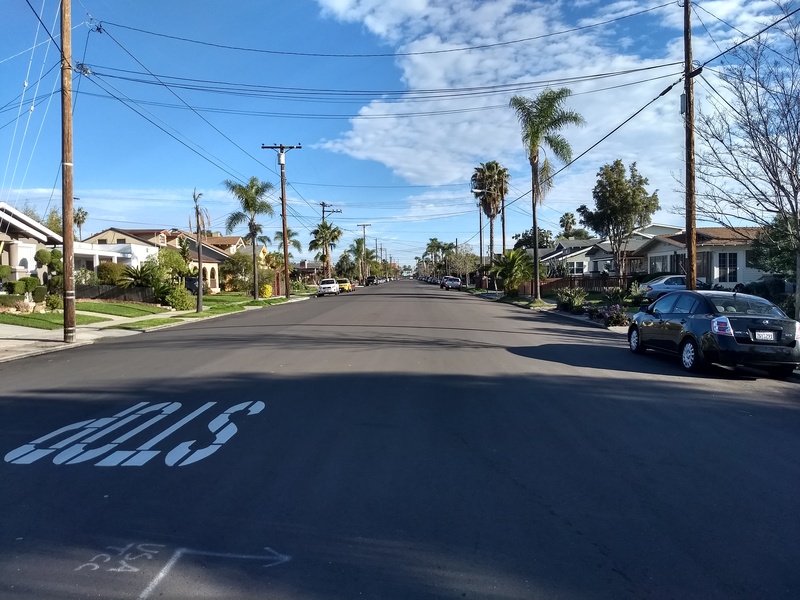 Reduce the road width and increase the size of the housing parcels (increase the public right-of-way usable by property owner) – this would increase home values and the tax base, bringing in funds via property taxes, and allow for planting of trees or other use. Install a bike lane to enable more residents to bike to work or school. Do nothing. The status quo, although mostly a vista of asphalt, has real potential and we shouldn’t discard it for more unneeded free parking. 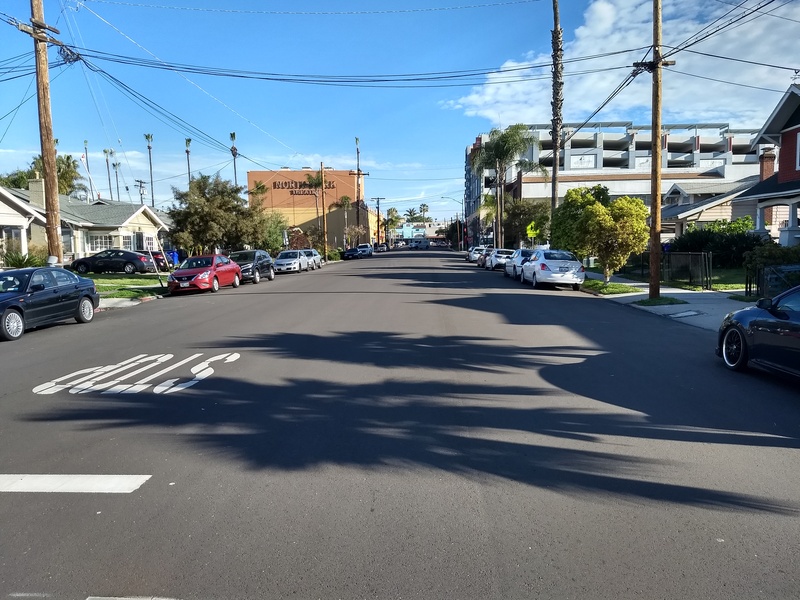 Not to mention that once granted it is very difficult to repurpose parking area to other uses, as recent debates in Hillcrest and elsewhere have underscored. If you have an opinion on this proposal you can attend the North Park Planning Committee Hearing on 4/17 or contact the group via email at info@northparkplanning.org. Additionally, on my street – Granada Avenue – I’ll be working with the other residents to proactively state our opposition to this sort of conversion. 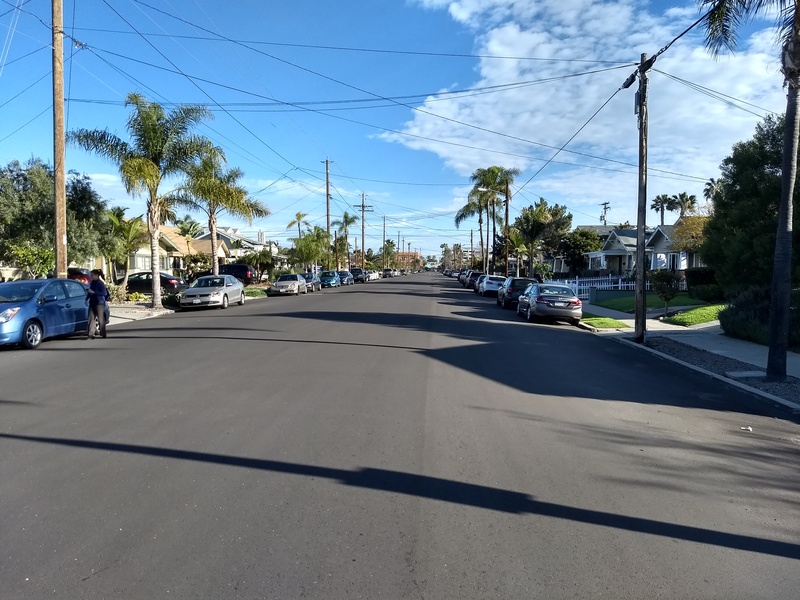 You can consider doing the same as it seems likely the many over-sized roadways in San Diego will likely follow 29th Street in becoming a parker’s paradise.